I don't know about you, but when we found out we were having our first, we were overwhelmed with the list of things to buy for the baby. As a new parent, one of our concerns was being able to see, hear and know that our baby was safe during nap or sleep time. Which is why I wanted to share 5 things to consider when choosing the perfect baby monitor. Baby monitors can offer a view different types of displays. Some display a chart that indicates any noise made by your baby. This would be a great option for someone who is looking for a visual indication of noise coming from the nursery or would like to listen to music while in another room. Another option is a video feed. Do you want to see exactly what is happening in the nursery or is audio the extent of your needs? Consider if two-way talk is something you are interested in. This is a nice feature for babies who need a familiar voice to settle down. Additionally, what kind of listening will you be doing? Are you looking to hear every noise in the room? Or are you looking for a monitor that will pick up baby specific noises? Or do you want an option to switch between the two? Look into a monitor with more advanced Microphone sensitivity. 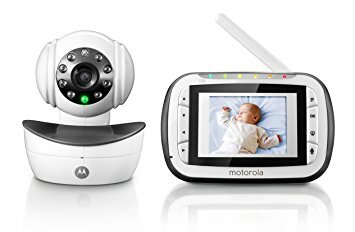 Another great feature many parents are interested in is a baby monitor that is capable of displaying the room temperature. Babies don’t regulate their body temperature as well and this is a great tool to help ensure the room temperature is safe and comfortable for your little one. In addition there are monitors which includes a device that tracks your baby’s movements, breathing, or heart rate, and offer time-sensitive alarms that alert you if your baby hasn’t moved in the last 20–30 seconds. While they aren’t proven to reduce SIDS, they can give you an added peace of mind. If you are worried about being there even when you are not at home, a baby monitor with an app that connects via Wi-Fi may be a good option for you. When you are at a client meeting or out to dinner with your partner, you can still be connected and feel like you are in touch with what is going on with your little one. A sensorial baby monitor for the win: Wifi, two-way, night vision and temperature monitoring! At a great price - less than $70 on Amazon! Finally, when we were choosing the baby monitor, it was important for us to find one that was easy to set up and use. Let's face it, when you are a new parent and running on less sleep, you don't need extra hassles or worries. So choose one that is easy for you to understand and for this, you just need to try it for yourself! Hopefully these 5 tips help you with checking off one item on your mega baby registry list! Good luck parents - you got this!